Systems Flow has been a long-time advocate of the UML for diagramming system architectures. All our consultants are trained in the basics of the notation – and in our unique stylistic and formal extensions. We believe that a rigorous but simple approach to diagramming is the most critical ingredient to formal communications in a mixed business/IT environment. 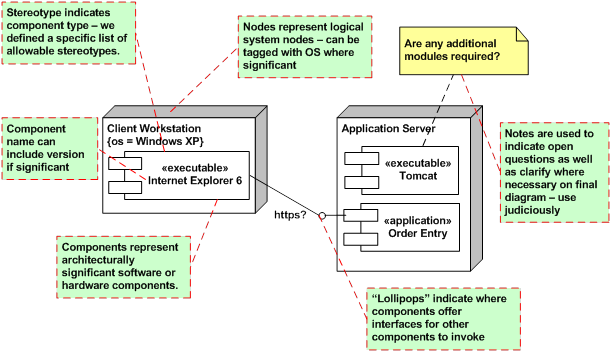 Conventions: Models logical systems as nodes, include architecturally significant components, show interface providers with “lollipops” and interface consumers with a connecting line. See Investigative Architecture – Logical Diagram for more details. Conventions: Show real time and batch feeds between systems, as well as the nature of the data being transferred. See Investigative Architecture – Data Context Diagram for more details. Conventions: Trade accuracy and completeness for simplicity and marketability. Use limited set of recognizable icons. See Investigative Architecture – Conceptual Diagram for more info. Learn more about diagramming and UML for Enterprise and Solution Architecture here on our blog, or check out some of our publications; Leveraging UML as a Standard Notation for Enterprise Architecture is a good place to start as it presents a slightly more detailed overview of this topic. We invite you to join us in championing the value of a clear set of diagramming standards for your organization! Please contact us, we’d be happy to help.